Roger Federer survived a scare Wednesday afternoon against Davis Cup teammate Stanislas Wawrinka. The Swiss duo won Olympic gold in doubles back in 2008, but in singles against each other, it is the Swiss maestro who now leads their head-to-head, 13-1. The match started in favor of Federer, who came into the fourth round encounter with some concerns to his back. In nearly routine manner, the first set was over and the crowd was sensing half of the equation to a monster quarterfinal between Federer and Nadal. Federer however, squandered a break lead in the second set, then going into the tiebreak, double faulted on set point to gift Wawrinka the set. Early in the third set, it nearly appeared to mirror previous losses. The Swiss star botched a love 40 break opportunity, and at a judgment moment of love 30, got into an argument with umpire Fergus Murphy on the amount of time after a serve for making a challenge. At one point Federer simply asked to speak with tournament referee Lars Graf instead. What would ensue minutes later would turn the match around. Wawrinka broke at love, but instantly Federer broke back, holding serve for 3-2. The match would stay level until the final game. A few mishaps turned costly for Wawrinka, who appeared to grimace in discomfort (left hip). One final break and Federer booked his spot in the quarterfinals in Indian Wells for the eighth time, 6-3 6-7 (4) 7-5, in 2 hours 20 minutes. The Swiss hit 5 aces, 2 double faults, while serving at 60%. He won 66% of points on his first serve but just 50% second serve points; 5/15 on break points. Immediately following was Rafael Nadal coming from behind to defeat Ernests Gulbis 4-6 6-4 7-5, completing the second half of the highly anticipated quarterfinal. 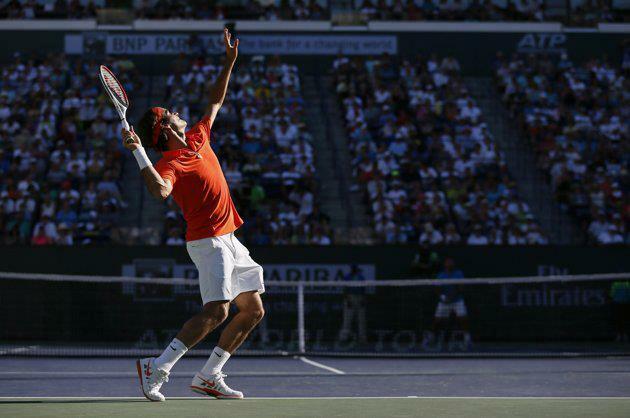 Watch Roger Federer vs Rafael Nadal, Thursday March 14 at 7pm on FF07tv. Federer’s exchange with umpire about challenging his serve.